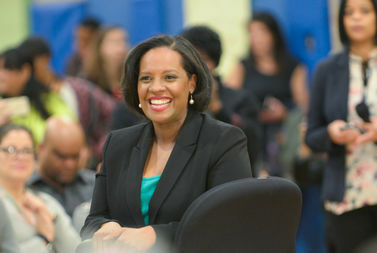 Councilwoman Julissa Ferreras-Copeland at a recent mayoral town hall in Corona. ​CORONA — Councilwoman Julissa Ferreras-Copeland, who has served in the council since 2009, will not seek re-election this year, sources said. The councilwoman, who was considered a front runner for council speaker next year, will finish out her term at the end of the year. Her office declined to comment to DNAinfo New York, but in a statement to Politico, she said her decision to not run again was based on her family. "After a great deal of thought and prayer, I have decided not to run for reelection," she told the news website. "I have had the privilege of representing the 21st District in Queens for 8 years, where I’ve fought for the education of our children, the rights of women and families, and the protection of our immigrants." She currently splits her time between East Elmhurst and Maryland, where her husband, Aaron, is an aerospace engineer. She also has a 3-year-old son.